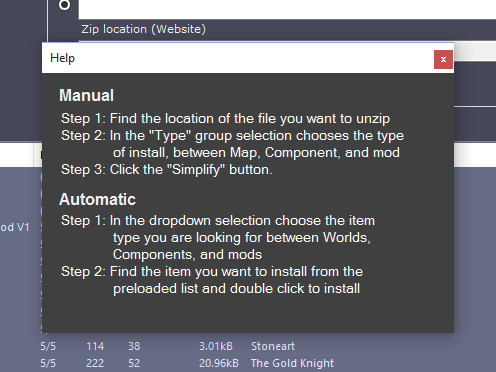 Total Miner Forge Simplifier is a tool which makes installing Maps, Mods and Components easy! Just choose the file type, open it in TMFS, and it's installed! 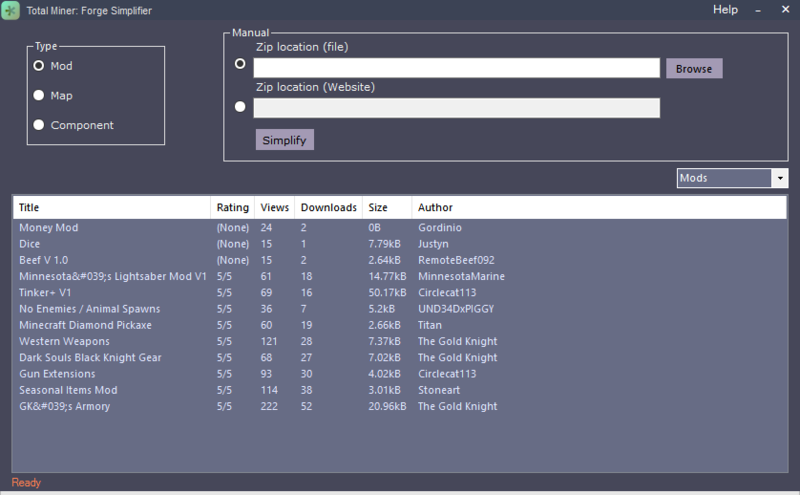 TMFS also features an easy downloader which scrapes a list from the forums and downloads uploaded files for you. If you want to see yourself in this list, contribute to the open source project which you can find under the download below! Perhaps add one more option for Type titled "Packs" or something along those lines, for downloads that contain say, a mod and a component, or a component and a map, or even all three. If there was another downloads section on the forums for them we definitely would. But at the moment, no one is creating packs like that and without a proper standardized format for the downloads we can't make an installer for them. As a heads up, my mods will be adopting the folder structure of Mods > ModFolderName, which I'm hoping will become a standard format, as this way it only needs to be dropped into the TotalMiner folder. New update released! Please check the downloads page to download the most recent update. But its already the standard to put everything in the root without unneeded folders? What's the need to complicate things? I get that it seems easier, but its just dropping in to 1 more folder in. Ultimately I think most people will end up using whatevers easiest and changing the folder structure so that it no longer works with TMFS will just make it difficult for me not only to make compatible but also for the people using TMFS. I agree. You should archive your mod folder only, not parent folders. Exclude the Mods folder from your archive. People will quickly learn to extract the archive into the Mods folder. Adding the Mods folder to your archive is just confusing the issue. TMFS Launcher please, where we can just get auto updates! If anyone hasn't already noticed, TMFS has updated a few times since release and now features auto-updating! Download it today. Is there any way the program could show what mods you already have installed? And perhaps a way to uninstall mods too? Yeah, should be quite easy. I'll work on that soon. Now that we have >20 Mods, its time for another TMFS update! Unfortunately at the fault of Hayden, we released a Debug build which sadly means that the autoupdate is broken on some newer versions. If you updated to 2018.01.12.0 you will have to manually update. Sorry for the inconvenience.